The NOURISH Yoga Teacher Training Program is designed to prepare you for the joys and challenges of yoga teaching, provide you with the highest quality instruction, give you time to absorb and apply information learned, and get you started on the path to teaching yoga as soon as you are ready. Rather than a straight line that begins and ends, our courses are offered as a cycle that you can enter whenever a new course is beginning. All 6 of the courses included in our program are 4 weeks long and meet twice per week. Unlike programs that meet once per month, the twice per week course meetings give you lots of reinforcement of information learned, opportunities to have questions answered as they arise, and encourage deeper and longer lasting retention of knowledge. 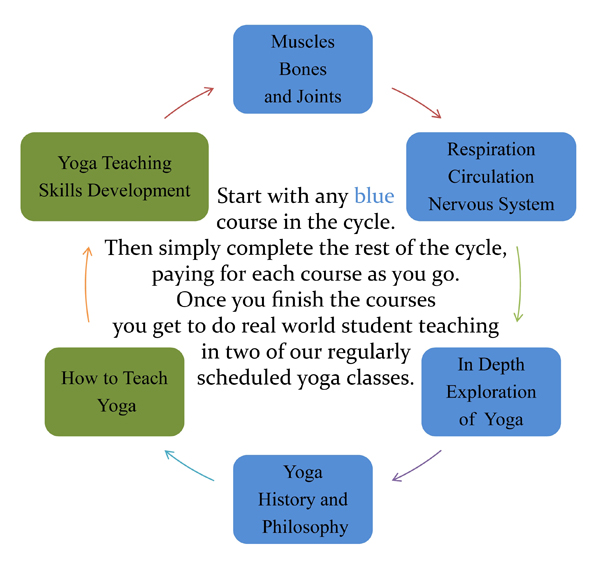 Once you've finished all 6 courses, you'll have the opportunity to student teach for 8 weeks in 2 real life yoga classes per week! 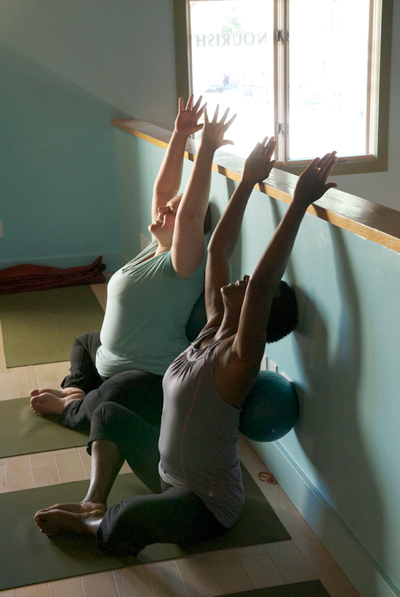 While many teacher training programs give you a chance to teach only to your peers, the NOURISH Teacher Training Program gives you the opportunity to practice teaching in actual yoga classes. While we know that at first this may sound intimidating, we also recognize the value of gradually learning to teach regular yoga classes in a supported environment, with mentorship and guidance. If you're ready to get real about teaching yoga, this is the program for you. One of the other unique features of our program is that even if you are not sure yet that this is the best program for you, simply enroll in a single course and see how it goes. We think you'll likely love it and want to continue with the entire program, but in the event that you do not, then you aren't obligated to continue. Finally, it is important to note that class sizes are limited for each course. It is not our goal to train as many people as possible as quickly as possible. Our goal is to train teachers thoroughly, to support not only enthusiasm for yoga but also dedication to its practice, and support those who do graduate from our program in becoming the highest quality yoga teachers they can be. "I've taken yoga from Victor Dubin for 10 years in various locations. NOURISH is the best one yet: convenient, clean and colorful, it's a pleasure to show up. Victor and Roxanne are both excellent instructors who really care about their students. The owners, Victor and his nutritionist wife, Jocelyn, take an interest in the community and show compassion for the needy, which adds to the robust feel of the place. In fact, the entire NOURISH team, including the desk staff, are warm and friendly. It's an inviting studio in which to learn yoga. " "Victor's yoga teacher training program had a profound impact on my life. His challenging yet humorous teaching style fosters both rigorous study in the yogic tradition as well as self exploration. His expertise in anatomy, the art of adjustments and his comprehensive understanding of the asanas compliment yogic philosophy and time spent in self study. This experience fundamentally shifted my relationship to my practice, deepened my commitment and ultimately placed yoga at the center of my life."